next model has lithium ion batteries. My advice to you ( and to anybody else ) is try before you buy. If you cannot try one, don't buy it. Even if you have to make a trip to the big smoke to try one out it's a whole lot cheaper than making a nasty and costly error. He think he still in China where free advertising a fake product on the forum with a rip off price is a norm. Steven, you can sell your product in Sydney China town, basement of darling harbor market city, next to the vegetable shop, there's a bank of toy shops selling imitation Mattel toys. Good luck. Not sure how anyone could justify paying these kinds of prices on a device they've never ridden or seen in-person. And two questions -- who do you call in China when the thing brings down? Will they pay the shipping costs?? 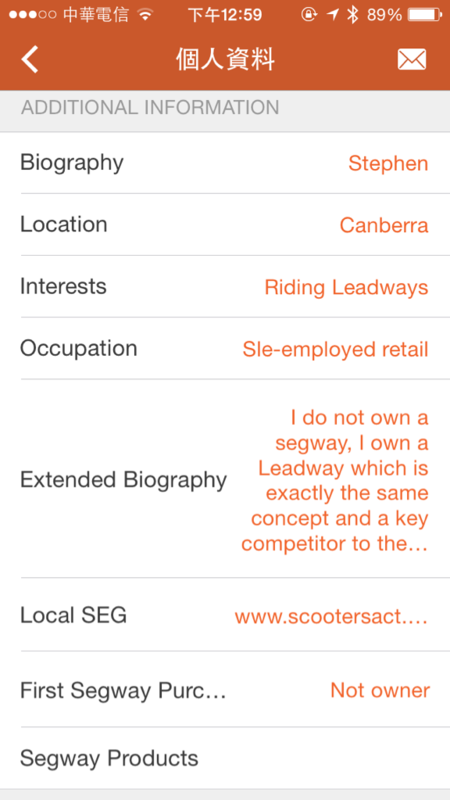 Those Chegway is everywhere now, and it is given Segway a real bad name, as in Asia, they advertise their unit as Segway. As for the question of who do they call when the Chegway breakdown? here in Taiwan, they call us wanting to repair their lead acid battery and complain it breakdown after 500 meters of usage. We just laugh and hangup when we hear it's using lead acid battery. Which is it? getting one, or has one? Thanks for exposing this liar. Advertising a cheap copy on a forum about the real products is not something new, but I have never seen a spammer dumb enough to post 'I'm a liar' directly in their account profile.